I’ve Been Meaning To . . . | Love Those "Hands at Home"
Category Archives: I’ve Been Meaning To . . .
Just look at these busy, happy hands! As one of the people behind these hands, learning the most basic techniques of weaving, I can tell you that the hands often felt awkward, inept even. The hands faltered but did not fail. And the inexpert, novice hands were guided by the expert, experienced hands to a place of satisfaction. I told you about a month ago that I’d been meaning to learn to weave (IBMTD) and that I’d found a workshop to take. It had been a long time since I had taken a course. I like to think I can learn things on my own, by doing research and reading. I’m often stubborn about seeking guidance and asking for help. I tend to flap about and try to teach myself and make a lot of mistakes and get frustrated. But, having just finished the workshop, with my husband and two other weaving newbies, I’m reporting back and also want to encourage you to take a course the next time you want to learn a new skill. And, P.S., weaving is a wonderful route to go, if you haven’t tried it before. The workshop was perfect. Run by our local arts council, we had a teacher who is both an expert weaver and passionate about introducing new people to a craft she loves. As a bonus, she is also a retired teacher, so she actually knows how to teach! The workshop was limited to only four students so we got to know each other well and got lots of specialized help. None of us had any background at all in the craft so we learned together and from each other. We learned on very simple frame looms; basically these were made of four pieces of wood and some nails to wrap string (the warp) around. 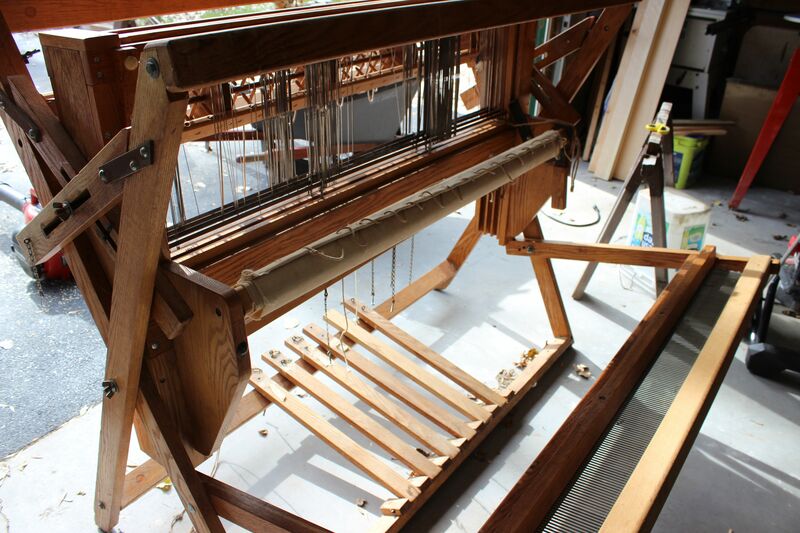 At first I thought I’d hate these looms—I wanted to learn on a big, fancy floor loom! I wanted to make shawls and blankets and twills and tweeds. 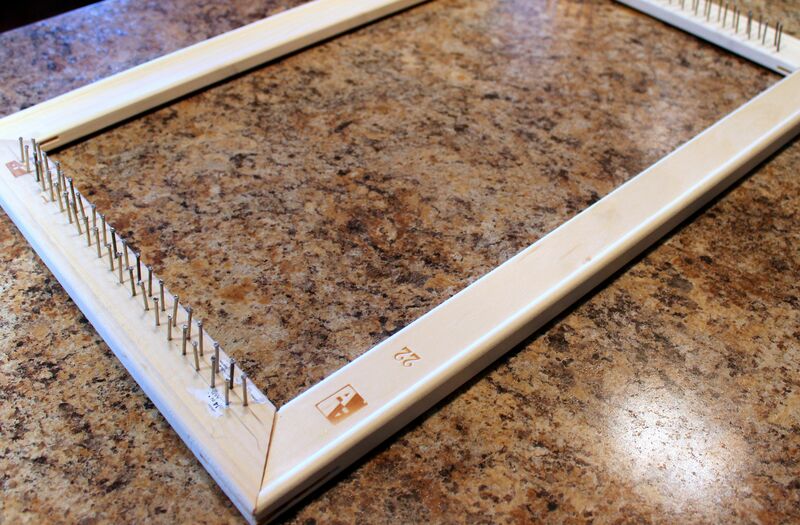 But we all learned to love our small, portable frame looms. 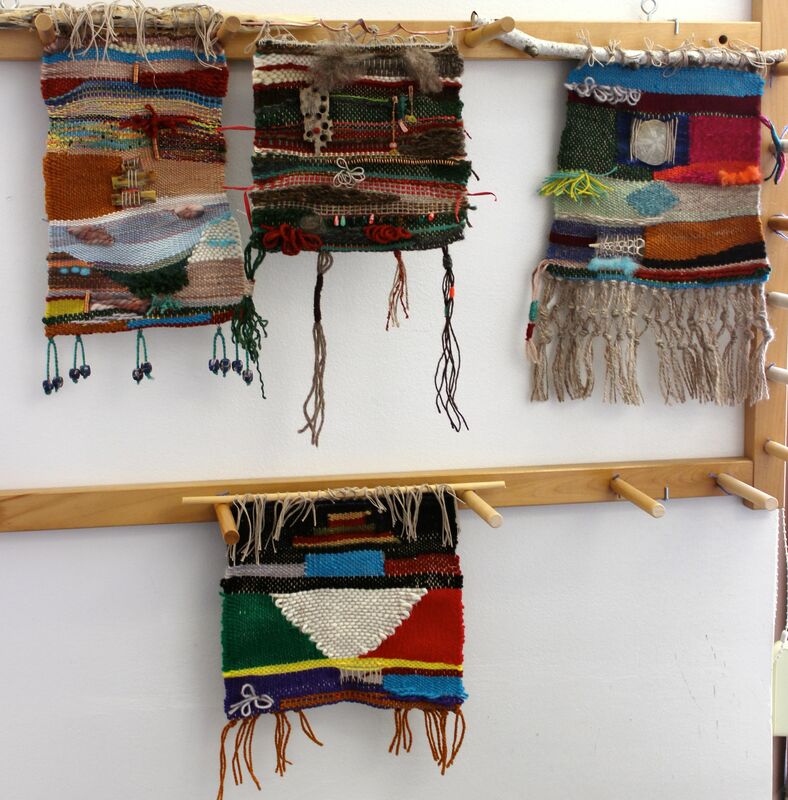 With the guidance of our teacher, we each made a small tapestry, incorporating many basic weaving techniques. We learned a new vocabulary, along with the skills—warp and weft, of course, but also sumac and tabby and rya. 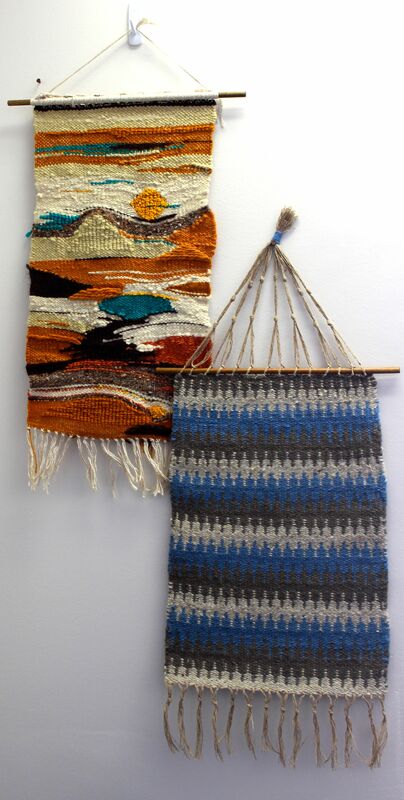 The neatest thing about this kind of weaving is that it could be almost entirely improvisational and encouraged experimentation and creativity. Whereas loom weaving, as I understand it, relies heavily on following patterns and being very precise, our weaving evolved mostly without plan. We chose colors as we went. We added different textured yarns and string and other fibers. We were shown how to incorporate shells and metals and stones and beads. It was as if we couldn’t make mistakes and that is a wonderful, liberating way to learn! We had our final class yesterday, put the finishing touches on our masterpieces, and sat back and appreciated them. As the final session of class wound down, we got great news! Our instructor has arranged with the arts council to allow three of us to continue to the next level. In two weeks, we’ll start a new workshop to learn to use harness looms and to thread the heddles and sley the reed (whatever that means)! I’m excited about this new venture but I know I’ll miss my homely little frame loom. When I looked at our finished tapestries, the best part was seeing how different they were. Four people started at the same place, with access to the same materials and techniques, and created four entirely unique tapestries. I’m sure there’s a profound metaphor for life here somewhere . . . It all started when I finally did something I’ve been meaning to do (IBMTD) for ages and, in doing that one, I managed to knock off two other goals at the same time. I hit the trifecta! I’d been meaning to call him but am so phone-averse that I just kept putting it off. But as I’ve been trying to work on my quilt project, the need became more pressing. Every time I used the machine, the thread was constantly leaping out of the take-up lever and jamming everything. I’m bad enough at sewing without having to deal with that! So, I called Mr. P. and he came later the same day—all the wonderful things I had heard about him were true! He cleaned and spiffed up my mechanical machine, and now it works just great. While he was here, I brought up the subject of my fancy computerized machine. I have had this machine for quite awhile and I LOATHE it. It has been a big computerized albatross around my neck for years and has generated quite a lot of family lore, in all of which I come across as a fool. Everyone else who has this kind of machine loves it but I have not been able to reach any sort of détente with mine. Some will say the fault, dear Kerry, is not in the sewing machine but in yourself. Whatever. The fact was, it was not working, yet again, and I asked Mr. P. about it. He, the sewing machine whisperer, couldn’t fix it. The nearest location where it could be fixed is a two-hour drive away. Ai yi. Here we go again. Fast forward in the discussion. I was talking about how much I like a mechanical, as opposed to a computerized, machine. 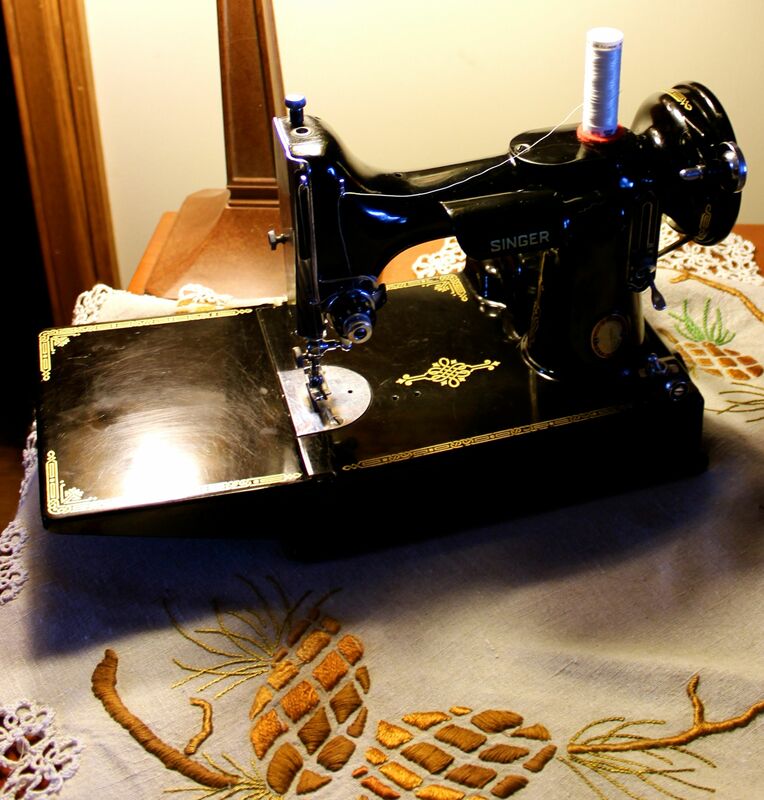 I mentioned how a Singer Featherweight seemed to be just about my speed and how I’d always wanted one. “Could I buy one?,” I pleaded. And he, lovely man that he is, came up with a solution that made both of us happy—we could swap. He would take the evil, devil-possessed computerized machine and trade me a sweet, docile Singer Featherweight! 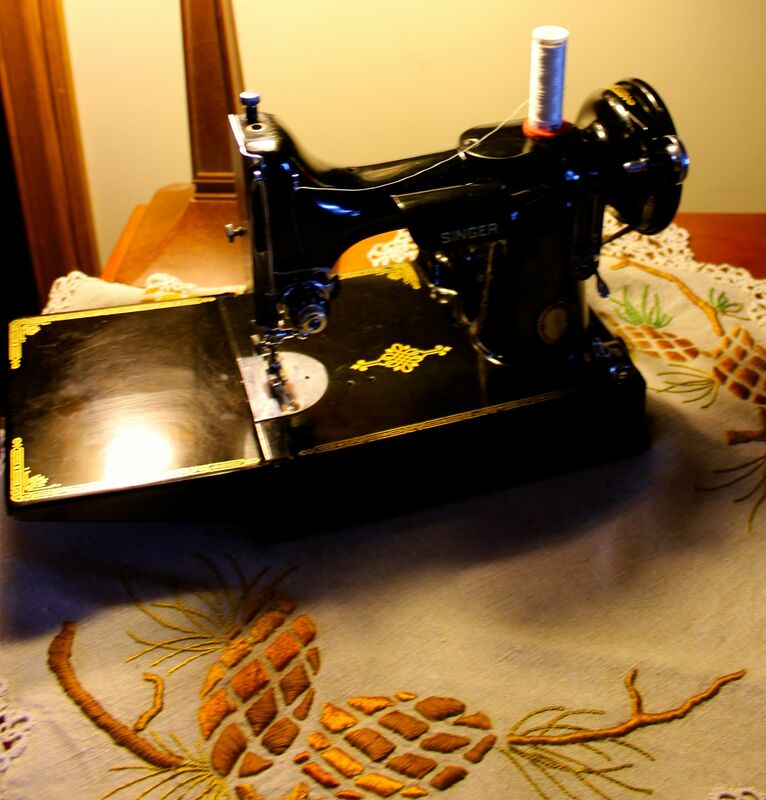 For those of you not familiar with the Featherweight, they were made in the mid-20th century. They are designed to be portable, fit neatly into a carrying case, and weigh only 11 pounds. They are small and quiet and have no bells and whistles whatsoever. They are especially popular among quilters. It’s everything I could want! Mechanical. Old school. Sturdy. Easy to fix. Cute. Most important—it is NOT smarter than I, unlike some machines whose names must not be spoken! You may think this is the dumbest decision you’ve ever heard and that I got the short end of the deal. But if you could have felt the joy and relief I felt when that computerized machine went down the driveway, maybe you’d understand. So, today I’ll spend some time getting acquainted with my sweet new friend. Have you ever wanted something so bad that, when you got it, all you could do is sit there and grin at it? I just realized it’s been two weeks since I’ve written about something I’ve been meaning to do! I’ve been meaning to write about what IBMTD—really, I have! I wouldn’t want you to think I’m a slacker so I will give you the most recent news, although there will be more to come. I, with my husband, signed up for a beginners’ weaving workshop offered by our local Arts Council. The classes start a week from today and will lead us, we hope, to finally making sense of the biggest, dumbest impulse purchase we may have ever made. We’ve been meaning to learn to weave because last year, at a garage sale, we bought a humongous floor loom. We bought it even though it’s a) humongous, b) we have no place in the house for it, and c) we have no idea how to use it! But we got a great deal on it! It has been sitting in our garage, mocking us in a slightly sinister way, ever since. But that’s all going to change. Pretty soon I’ll be throwing around words like warp and weft and heddles. And stalking blogs about weaving, trying to figure out what I’m doing. God knows, I need a new hobby. To fill up my free time. Do you know how to weave? Any basic words of wisdom for us? Since I finished my last quilt (finally! ), I’ve been meaning to start a new one (IBMTD). I love to have a project to pick up and work on at odd moments and I love the process of stitching and watching something pretty develop from my own hands. But I hadn’t started anything because I simply wasn’t inspired. I didn’t know what direction to go, what pattern to use, what fabrics to choose. Nothing was speaking to me. But then I learned about a quilt challenge that has been going on for a couple of years to commemorate the bicentennial of the War of 1812. This project focuses on the making of “cot to coffin” quilts and has been taken up by quilt guilds in towns where battles took place in the War of 1812. Quiltmakers design and make quilts of 70 inches by 30 inches, using techniques and fabrics consistent with what quilters would have had access to in 1812-1814. The moment I heard about this project, I was smitten, and inspired to make a quilt for the 200th anniversary of the Battle of Plattsburgh, NY, to take place in September 2014. Other members of the local quilt guild will be making quilts, too, and the entries will be displayed during the celebration. First, of course, I love that I’m quilting. I love adding my hands to the tradition of working with textiles to create beautiful, meaningful, and useful objects. Second, this project takes history out of the dusty past and asks us to re-consider an unusual war. The War of 1812 was supposedly fought between Great Britain and America but really mostly affected the lives of Americans and Canadians, as well as native peoples of the area. When the war was over, both Americans and Canadians considered themselves to have been victorious and the outcome has led to 200 years of peace and good will between the two countries—you can’t make that claim for a lot of wars! I also love that these quilts focus us on people often overlooked by history—the foot soldiers and the women left at home as the battles were waged. The size of the quilts was determined at least in part because of a tradition documented from the later quilts made for Civil War soldiers. The size of 70 inches by 30 inches is “about the size of a man” and organizers of this quilt challenge thought it was possible that such quilts, which were “small enough to roll into a backpack while on the march . . . and may well have served as a burial shroud,” would’ve been used in earlier wars as well. Third, this quilt challenge appeals to me is because I grew up in the Plattsburgh area and have been hearing about the Battle of Plattsburgh my whole life. I can envision the locales where the fighting took place and I see historical markers every day that remind me of the battle. Beyond this, my own ancestors have lived in the North Country of upstate New York at least since the late 1700s and, since I know they fought in the American Revolution, it seems likely that some of them also fought in the War of 1812. Did some woman in my lineage make a quilt to accompany a man she loved, as he went off to fight? Even if not, I know that eyes related to mine watched the battle. The family farm was on a hill overlooking Plattsburgh and Lake Champlain. The story passed down through generations tells of my forebears hiding the cows in the woods, so British soldiers wouldn’t take them for food, and then watching the battle take place on the lake below. Fourth, this project excites me because it will allow me to honor a song I’ve loved for a long time. I’ll tell you more about all of this in future posts but a key part of my quilt design is a set of panels upon which I’ll embroider the words to this song. The song is called “The Banks of Champlain” and I learned it years and years ago from an album by my folk hero, Pete Seeger. The song is said to have been written by the wife of the field commander of the Battle of Plattsburgh, to convey her thoughts and worries as she watched the battle unfold. I love this romantic narrative, as it poignantly relays the thoughts of a woman who worries about her husband at war. She doesn’t just send him off to war and worry from afar but, rather, she watches as he fights the war before her very eyes. Her husband, Alexander Macomb, and his counterpart, Commodore Thomas Macdonough, are given historical credit for the strategies that allowed a small contingent of Americans to defeat the much larger British force. So, I have a new project that combines a craft I love, history, romance, a family angle, a folksong—what more could I want? One more thing—a clear, unequivocal deadline! With my history of letting projects languish incomplete for years, it’s motivating (and a little terrifying!) to have a specific date by which this needs to be finished. And that date is the end of June. Expect to be hearing more as time gets tight! I’m a Yankee. I love winter. Really, I do. No, really. But, sometimes, a person needs a break from the cold and the gray and the usual. So, for a while now, I’ve been meaning to (IBMTD) take that break and, with my husband, avail myself of the kindness of two sets of friends who spend winter on the Gulf Coast of Florida. “Come,” they said! “Stay!” Such very good friends . . .
We’re so glad we took the time and went! It was a marvelous trip and, in hopes that these photos will allow you to experience vicariously some of warmth and beauty of this amazing place, I share them here. Miles of beach . . .
SUn breaking through the fog. We loved the variety of animals that one simply does not see in upstate New York. And, oh my, we loved the dolphins. The week went quickly (even with the extra day that we got as a result of a flight cancellation!) We’re back in the snowy and cold Northeast now, pondering winter festivals and snowshoes. But I also have a mother who lives in Florida! And she says, “Come! Stay!” So, we’ll be heading back one more time, for a little antidote to the rest of winter. What lucky folks we are! I think a country auction is just about a perfect way to spend a few hours. Why? I love vintage and antique, especially unusual items. I love the drama and thrill that comes from winning a bid. I’m not sure there’s anywhere else these elements come together and yet, in 3 years of living in this rural area, I’ve been to exactly one auction. So, this, too, has been on the list of things I’ve Been Meaning To Do (IBMTD). We went to an auction recently and had a great time on all counts! 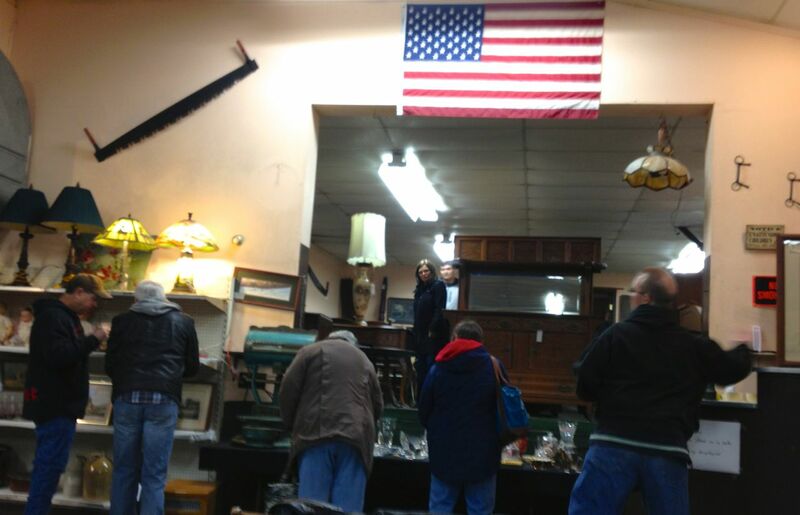 The auction was all about vintage and antique items. This particular auction house seems to pride itself on offering good quality and the auctioneers are very knowledgeable. They did sell some big lots of books and fabrics for very low prices but most of the auction focused on better-quality items. The items offered had a very rustic and unusual flair. From the stuffed raccoon, in perfect condition, to the Adirondack-style occasional tables (which belong to me now! ), this auction felt like it represented a very specific part of the world. 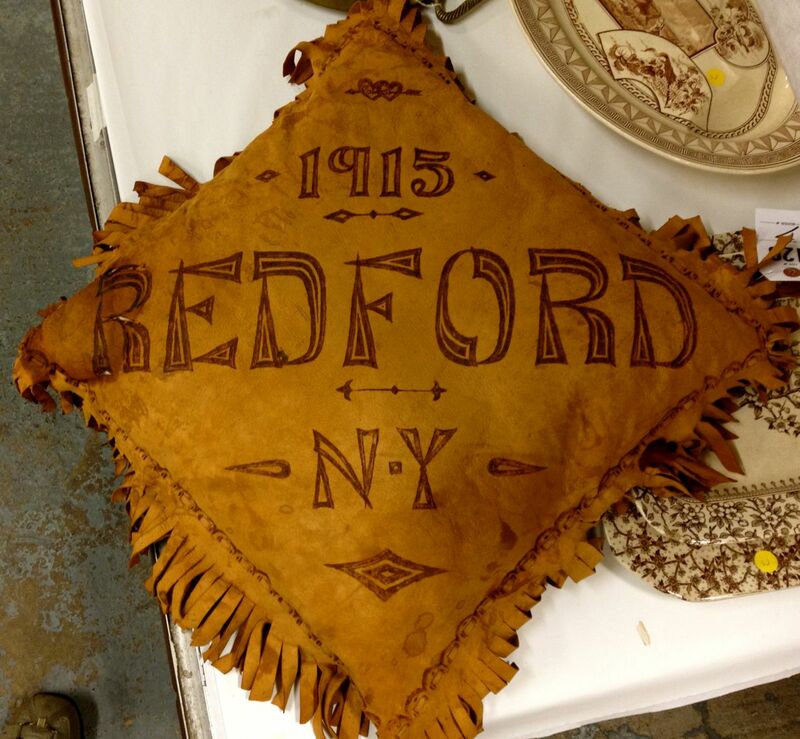 This wonderful handmade leather pillow could only have come from one tiny town in the foothills of the Adirondack mountains. 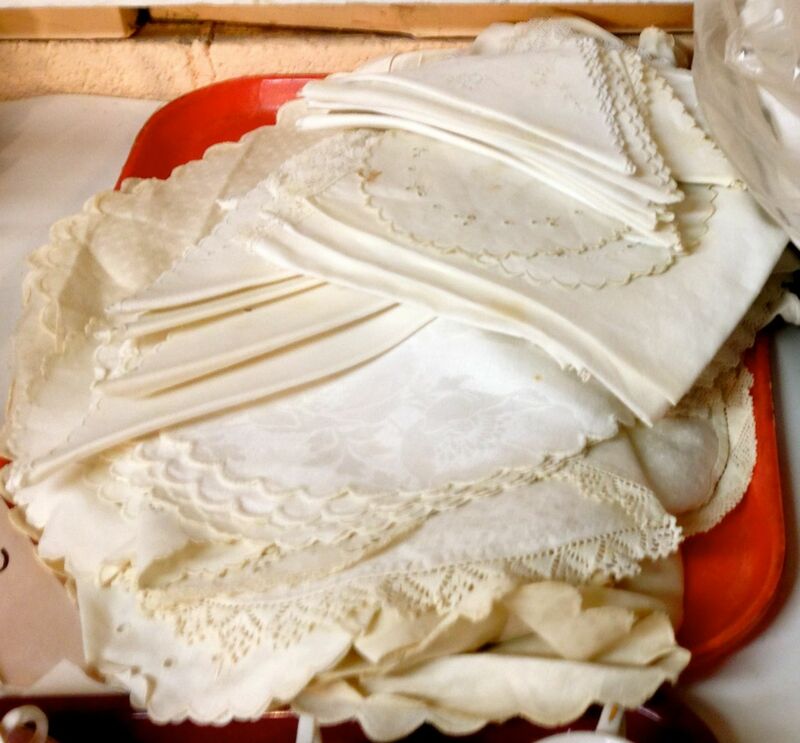 This particular auction also had some linens for sale. It was a mixed lot of Madeira linens, heavy on hand-embroidered cocktail mats and napkins, with a couple of very nice tablecloths, as well. You know I intended to win the bid for these! I had already won the bid for the tables and my pulse had remained steady but, when the linens were offered, my heart raced and my pulse quickened. I opened the bidding and hoped no one else would care about these old pieces of fabric. But a bid came from the opposite side of the room! The auctioneer looked back to me—was I in? Nod. Up it went. Nod. Yes. I’m still in. Yes. Yes. I’m in. Going once . . . twice . . . I won! My hands were shaking a little! You don’t get that feeling on eBay, my friends, and certainly not from meandering around a thrift shop. Did I get a bargain? Not on the linens, in particular. It was a good price but not a great bargain. But there were other bargains galore at this auction. Good vintage furniture was going for incredibly low prices—it made me wish I had a much bigger house, so I could bring it all home! And it has to be said that the buying and selling are only part of the fun at these auctions. The people-watching is superb, with all types represented, from auctioneers to buyers. Auctioneers are often real characters, so skilled at working their audience. Years ago, I saw an auctioneer trying to sell a box lot of odds and ends. The box was just a mishmash of kitchen tools—not worth much. The auctioneer tried to start the bidding at two dollars. No takers. One dollar? Silence. The bid went down. Would anyone start the bidding at a quarter? No? No? In his frustration, the auctioneer reached into his pocket and took out a dollar bill. He threw it into the box, with the junk, and hollered, “Now can I get a 50-cent bid?” The audience laughed hard and the bidding commenced. The auctioneers we saw last week are brothers. Both have the kind of patter we associate with old-time auctioneers and a great sense of humor. They watch the crowd like hawks and play with bidders, to get that bid going. They keep things moving, to let bidders know that you have to be in it to win it—she who hesitates loses! In the crowd that day were the laconic-style bidders who barely moved when they made their bids. These folks clearly go to every auction and seem to keep their bidding number from one auction to the next. We also saw the young, eager couple, excitedly waving their bidding card and piling up items for their home. The people behind us nearly squealed with delight when they won the beautiful banjo. People came and went. They drank coffee and ate doughnuts and Michigans. They tried not to show interest in the items they really wanted. They bought things they didn’t really want just because the prices were so good. It was a fun day for all and a perfect way to spend a cold and snowy winter day. Snug inside a big old auction house, warmed by the excitement of the undertaking, with treasures to be carted home at the end of the day. I’ll be meaning to go back!